On January 11th, 2015 hostilities between the Ohio Warriors and Homebrewers ceased and we were victorious. This was a very interesting war in that Homebrewers had multiple opportunities to win, but due to a lack of general overall war strategy and discipline they were unable to defeat us in the end. Clearly, they presented many challenges for us, including their numbers on the war map, which consisted of: 4 TH10’s, 2 TH9’s, 18 TH8’s and 6 Th7’s. Once again, there were no bases below a TH7. This lineup matched up several of our Th7’s against TH8’s, a very tough challenge. Our Th7’s were up for the challenge. DMSM was able to 3-star 2 TH8 opponents, an impressive performance especially given the fact that DMSM is a Th7. Great job DMSM! Participation: We used 59 out of 60 attacks, and cbeau was out of the country, and advised leadership ahead of time. Excellent job on using all of our attacks but one! We saw several failed attacks (one of mine included) and some errors in execution throughout the conflict, and we also saw several instances of superb execution. This post mortem will focus on analysis of our performances, observations, and explanations of some of the attack theories of the game. Francis Marion’s attack on #7 JScanBrew. This classic GOWIPE featured 2 Golems, 1 Level 3 Pekka, 1 level 5 cc Pekka , 16 wizards, 28 archers, 9 wallbreakers, 1 giant, and 2 healing and a rage. The giant and archers were used to dispense of the cc troops. There are several reasons why this failed. First, after the golems were deployed, the wallbreakers were all expended before the inner wall was breached. The Golems also were not healed soon enough, and they did not last long against what appeared to be maxed Tesla’s at level 6. Wizards were deployed in order to clear the way for the Pekka to enter the base, but this took too long and the Pekka entered the base alone, and against a wall that was not broken. The Tesla’s finished off the Pekka. On the other front of the attack it was a very similar scenario, except the Level 5 cc Pekka was smart enough to get out of dodge and head north, where he was finished off by another maxed tesla. Lesson Learned: The lesson I took away from this attack is to not split my GOWIPE in this fashion, and also to ALWAYS send both Pekka’s together. (Thanks Pati!) Tesla’s are a single-target defense and can only fire on one Pekka at a time. Also, with the difficulty of this base, the attack forces really should have been concentrated, and lastly Golems need to be healed a little quicker in order to get more mileage out of them. Brian’s attack on #16 JoeF: This classic Giant and wizard attack failed. The main reason on this one was that the clan castle troops were not eliminated, and they were level 5 wizards. Level 5 wizards will NUKE a big pile of Giants with splash damage in a hurry. Please don’t forget the importance of eliminating clan castle troops when you’re going in on the ground. It’s not like when you roll up in with 11 dragons and 3 rage spells. Wizards are DEADLY to your ground troops, and must be drawn out of the cc, surrounded by archers and/or wizards and eliminated. Heather’s attack on #15 HK: This classic Giant-Wizard attack was split upon 2 fronts, and failed because cc troops were not eliminated. Level 5 wizards came out and NUKED half of the giants very quickly. Also you will generally need more than 5 wallbreakers so the giants can continue to move. Especially with using Rage instead of Healing, you can’t afford to have your giants get hung up on walls because there is no healing waiting for them. Mo’s attack on #28 Fuzzy Jamal: This combo attack with 10 level 1 hogs and 7 level 2 dragons would have worked, except for the fact that the hogs were sent in without eliminating the cc troops first, which happened to be 5 level 6 wizards. The wizards fried all 10 hogs in about 2 seconds, leaving the AD’s untouched, and the dragons at risk. As a result, the dragons were not able to get to the AD’s and were killed. Folks, CoC war strategy 101 is to eliminate cc troops. There is virtually no attack other than all-dragon that can withstand the counter attack of level 5 or 6 wizards. When attacking a Th7 base in war, probably the highest success rate attack method is the 11 dragon attack. A TH7 base does not have the defensive capability to defend 11 dragons with rage. Dad’s attack on #22 Keef: A very rare no-star on a TH8 with 11 dragons and 3 rages. On this one from what I can tell there were 2 issues. First, I think the dragons were spread a little thin, making them tough to guide with rage. Also, the cc troops included a witch and level 7 archers, which appeared to tie up the dragons while the AD shelled them. Hindsight is 20/20, so I don’t think there was any way of knowing how this was going to transpire with the cc troops tying up the dragons ahead of time. Perhaps if the dragons were grouped tighter, a well-placed rage may have taken out the cc troops quicker. But as the first attacker in, there is no way of knowing about the cc troops including a witch. The other failed attacks were either mismatches or technical difficulties. JoeDBarr’s attack on #10 Dennis: You need to look at the base layout for #10 because it’s critical in identifying a glaring weakness to be exploited. Inside the walls there are no empty spaces in the cells which means there are no traps inside the walls. This base design is HIGHLY susceptible to hog attacks. Joe used 27 level 4 hogs (5 in his cc), 3 barbs, 15 archers, and 18 wizards, and 3 healing spells. The cc troop (a dragon) was drawn out with a barb and then surrounded and eliminated by archers and wizards. The hogs were released and healed at the proper times, and then wizards cleaned up. The attack resulted in 3 stars, easily. Well done, both in execution and in identifying and exploiting the weakness in this base. Shushu’s attack on #22 Aler22: Shushu used a classic GOWIPE with 2 level 1 golems, 3 level 3 Pekka’s, 10 wizards, 5 wallbreakers, 1 giant and 10 archers, along with 1 healing spell and 2 rages. As we have discussed before, Shushu used a single giant to draw out the cc troop (a dragon) and eliminated it with archers and wizards. Shu deployed both golens together (something I wish I had done on my second attack) and followed them with wizards and 3 Pekka’s, and then his cc troop, a level 5 Pekka was deployed. 2 of the Pekka’s went to the perimeter, but two went inside the base, and then tried to leave. However Shu hit the 2 with a rage, and they returned to the center and destroyed the TH. Excellent job resulting in 2 stars with 66% damage. Well done Shushu. One final note on this one, at one point it looked like he might not get the townhall, but Shushu knows the GOWIPE very well, and raged them at just the right time to get to the Townhall. Skyhawk’s attack on #14 Biggity: Skyhawk used 24 level 2 hogs, 4 level 3 dragons (including one in his cc), 1 archer and 6 wizards along with 3 healing spells. Sky used a single hog to draw out the cc troops, and then eliminated them with wizards and a dragon. He sent in his hogs and healed them at proper intervals, and these level 2 hogs were able to destroy almost every defense leaving the dragons with virtually no pressure from defenses. This base, although not as blatantly vulnerable as #10, still had very few empty spaces for traps inside the base and between defenses. Excellent job exploiting this design, and great mileage out of level 2 hogs as well. Well done for 3 stars. Heather’s attack on #16 JoeF: Heather ran an air ground combo attack using 8 giants, 8 wallbreakers, 21 wizards, and 4 level 2 dragons with 1 healing spell and 2 rages. Heather sent in the giants as shields for the wizards who did all of the heavy lifting. She dropped a rage on the wizards when they got close to the townhall and they delivered for 2 stars and and the dragons got mop up duty for 69% damage. Well done. Pati’s attack on #7 JScanBrew: Pati ran an advanced GOWIPE, and you just need to watch it. She used 2 level 4 Golems, 29 level 6 wizards, 4 archers, 3 level 3 Pekka’s, 2 jump spells, 2 rage spells, and 1 healing spell. Pati sent in the Golems, followed by the wizards, and when the peripheral structures are cleared, the Pekka’s. Deploying the jump spells in a path sends the golems, wizards, and Pekka’s straight to the center where they quickly dispense of the townhall, and then continue on to overpower this base, which is no match for a TH10. Well done for 3 stars. Eric Glispy’s attack on #20 Brewmaster: Eric went in with 28 Hogs, 2 level 2 dragons, and 3 healing spells. This is an excellent example of the proper execution of a hog-dragon (air-ground combo) attack. Eric lured out the cc troops with a single hog and then eliminated them with a dragon. He then sent in the hogs in 2 waves healing them at proper intervals. Dragons were deployed just before the second wave of hogs. It worked beautifully, and I encourage you to watch this textbook attack. Result was 100% damage and 3 new stars for the clan. Well done. Overall I think we are really starting to execute well, or at least better on our non-dragon attacks. I would love to see more usage of the Strategy page on the forum to share ideas, because the time is rapidly approaching where dragons are going to be used only in a supporting role. The Homebrewers really could have won, but either stubbornness or pride caused them to attack Lepios and Heather a total of like 14 times before finally taking them. That is a monumental waste of resources, and given that they had 4 easy stars available from our TH7’s at the bottom of the war map, they really should have won. As always we kept our discipline and it paid off. 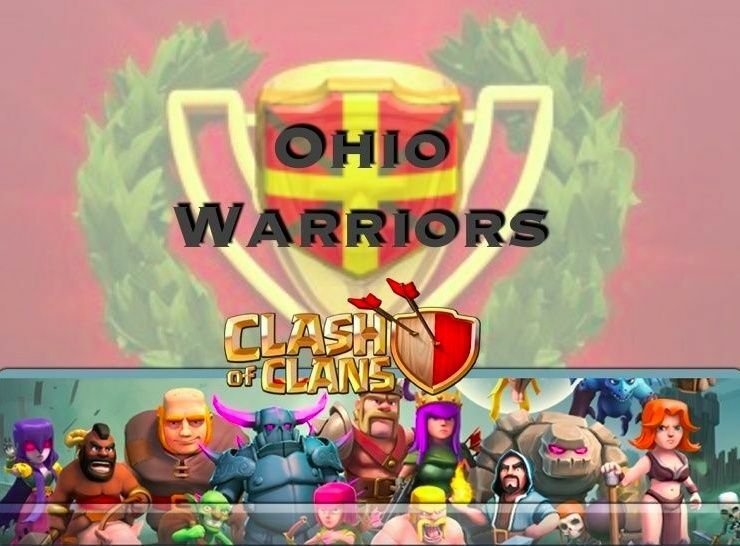 Congratulations Ohio Warriors on a fantastic victory. Comments welcome. Keep it civil. Interestingly, I had two attacks resulting in 99% damage. Basically, I just ran out of time. One by Barrjosephson and one by joedbarr. Very frustrating and not sure where I could have saved time, but certainly one has to think about time taken to eliminate cc troops. Yeah, cc troops are always a real issue for us. I think there is a balancing act on how you dispense of cc troops. Clearly archers take the longest to eliminate them. But I don't care for using too many wizards to do it, and I really don't like wasting my barb king on cc troops, because often times he gets wiped before they're all taken care of. It's a tough call.